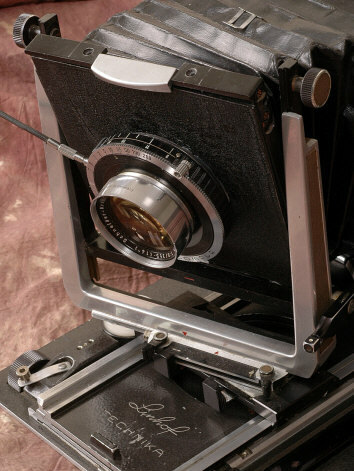 With more movements than a 4x5 Technika, a longer bellows, and a built in wide angle focusing rail, the 5x7 Technika V is arguably a better 4x5 Technika than the 4x5 Technika! 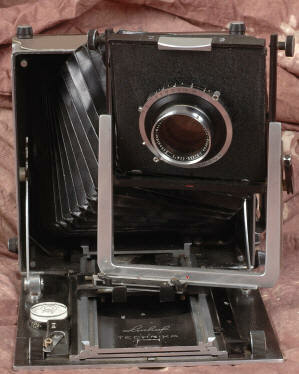 ANY 5x7 Linhof Technika is very hard to find. The Type V version pictured here is the last of the breed and next to impossible to find. 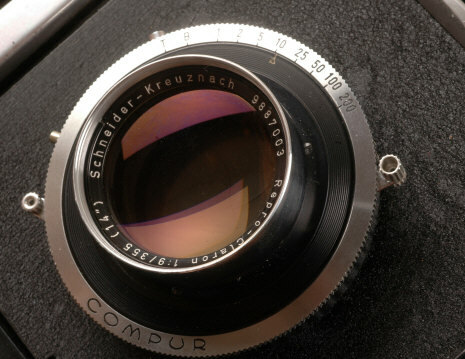 It is identifiable by the front rise lever on the lower left side of the front lens standard. Notice the lever on the lower left front standard? That makes this camera the Tech V version! 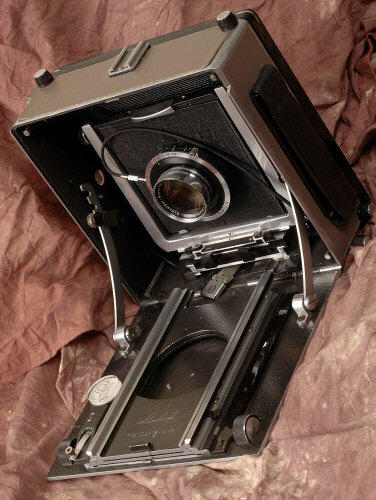 Extreme Falling Front: Mount the camera UPSIDE down with the tripod socket underneath the accessory shoe! 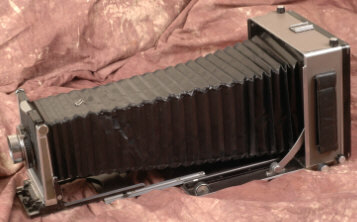 Lens Board size 5 1/8" by 5 1/8"
Size 10" x 10" x 4 5/8"
The 23" extension can focus a 500mm lens. 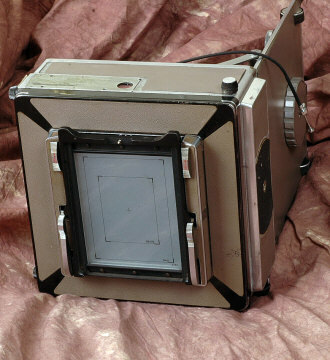 The KILLER DEAL of the 5x7 Tech V is that it generally has MORE movements than the 4x5 Tech V. Additionally IT HAS A BUILT IN FOCUSING SLIDE WITHIN THE CAMERA BODY FOR SUPER WIDES as short as 75mm for use WITHOUT additional focusing aids! The original body covering was replaced with a similar tan leatherette which could use some regluing. 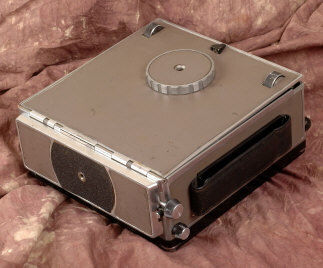 Uncovered is where the rangefinder was removed. 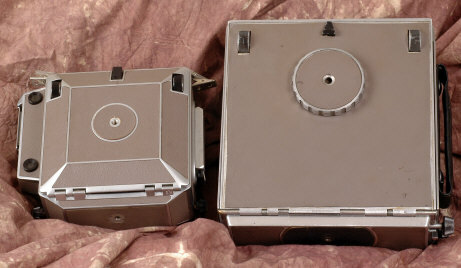 On the right hand pic, the larger of the two knobs is the built in focusing mechanism for wide angles. 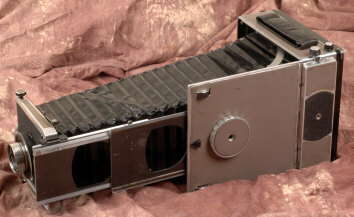 The lever locks the wide angle focusing rail. 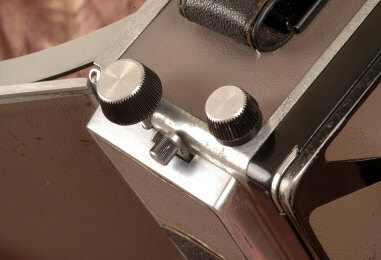 The smaller knob is one of the four controls for rear swings and tilts. 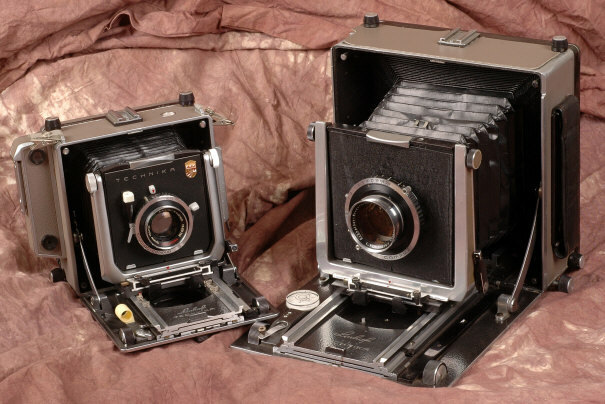 Clamshell folders, the 4x5 Technika V along side the 5x7 Technika V. With front rise, tilts, swings and slides, this Technika offers ample front movements for a field camera. 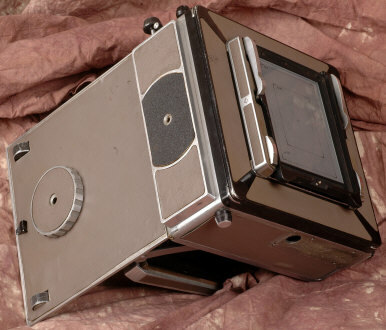 Do you notice anything missing from the right side of this camera, say, like the rangefinder housing and assembly? 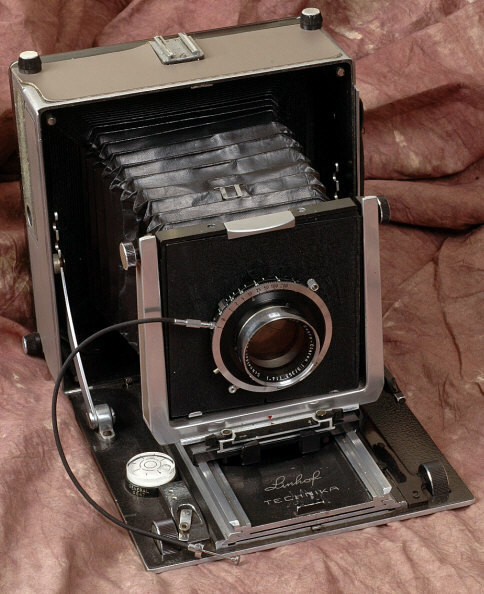 It was removed by a former owner to save weight and because real world, the rangefinders on 5x7 Techs are practically useless because who wants to hand hold a TWELVE POUND camera? 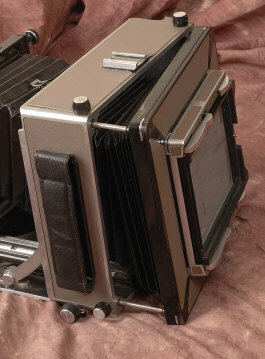 A smaller, lighter 5x7 is a smarter, better 5x7 Tech. 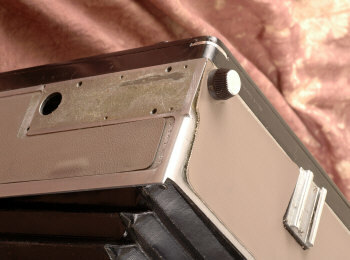 The forward knob of the left bottom is the focusing rail for super wides! 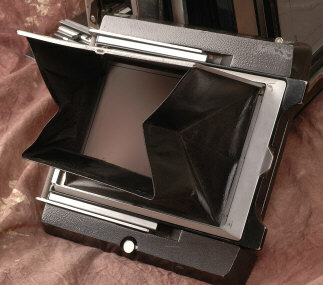 This was a new feature for the 5x7 Tech V. The Linhof brochure says it can focus even a 75 Biogon! 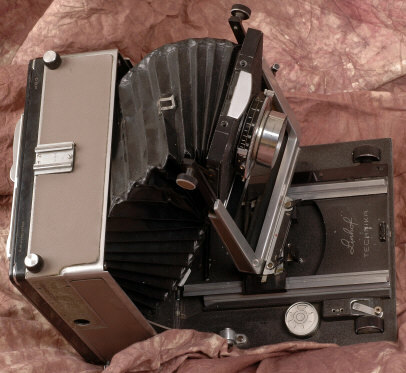 The 5x7 Technika V offers ample movements while still folding down nicely into a very portable compact box for field use. 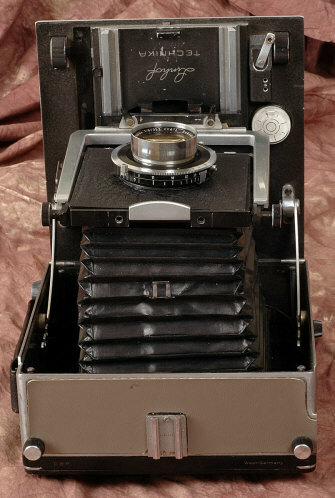 The camera is shown mounting a rotating 4x5 reducing back. 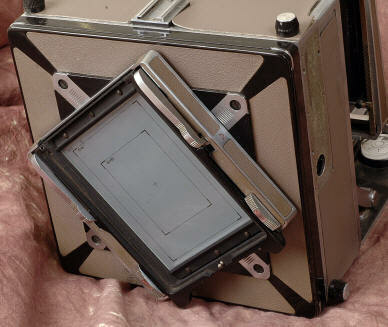 It folds down into a compact rugged box. 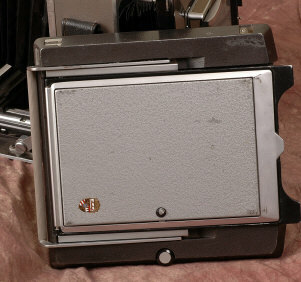 The camera has replacement leatherette on the camera body. It's similar to the original, but not exactly the same.